That's What We Want: That's also what we didn't have at Nonie Darwish's lecture at UNM last Thursday evening. Reasonable people may have different opinions, but Abq Jew says: They should express those opinions reasonably. Let's take a look at the parties involved. First, there's Nonie Darwish. Born in Egypt, Darwish is the daughter of Egyptian Army Lt. General Mustafa Hafez, who died while leading covert attacks on Israel from Gaza in 1956 and was called a “shahid” by the Egyptian president Gamal Abdel Nasser. Darwish blames “the Middle Eastern Islamic culture and the propaganda of hatred taught to children from birth” for her father’s actions. In 1978 she moved with her husband to the United States, and converted to Christianity there. Since September 11, 2001 author and lecturer Nonie Darwish has written three books on women’s rights in the Islamic world, Arab-Israeli reconciliation and other topics relating to Islam. She has spoken at many college campuses in the US and Israel, appeared on TV interviews internationally and has spoken before Congress, the House of Lords and the EU Parliament. Abq Jew's View: As he previously reported, Congregation B'nai Israel Sisterhood and B'nai's Rabbi Arthur Flicker withdrew their support for Nonie Darwish's talk beforehand, after they learned about her past statements, judged to be religiously intolerant and hate-speech. One piece of information considered in that decision was this YouTube video, entitled Nonie Darwish Says Islam Should Be 'Annihilated'. Considering her background and theme, it is clear to Abq Jew that (at a very minimum) Nonie Darwish has a large axe to grind. Abq Jew encourages Ms Darwish to grind her axe someplace where others' oxen cannot be gored, and recommends that the UNM Israel Alliance do more due diligence in the future when presenting someone perceived to be a spokesperson for Israel's rights and concerns. On February 23rd at 7PM, Three people, including UNM students, were attacked by pro-Israeli members on Wednesday night for mic-checking Nonie Darwish, a self-proclaimed human rights activist who was on UNM campus to deliver a talk on the Arab Springs. Darwish cast the Arab Spring in a bad light. She argued that democratic revolutions in the Middle East and North Africa, such as those in Egypt and Tunisia, would not succeed as long as Islamists controlled them. The protestors, some of whom are UNM students and affiliated with the (Un)Occupy Albuquerque movement, used "mic-checking" as a nonviolent tactic to voice their concern against the Islamophobic content of Darwish's talk. However, they were met with outright violence by members of the audience, who did not want to hear what the protestors had to say. Rather than simply wait for the protestors to deliver their message and leave, as has been the case at similar actions in other parts of the country, the pro-Israel audience members physically forced the protestors out of the auditorium. It is interesting that the audience members who assaulted the protestors were acting in support of Israel, which claims to be the "most-democratic state" in the Middle East. Freedom of speech is an important part of being democratic, and it is a tragedy that the pro-Israel members did not want to hear what the protestors had to say. 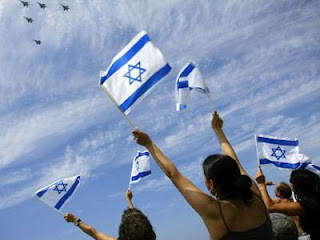 and genocide at the hands of the [Israeli army]. I was there. The protesters identified themselves as a Pro-Palestinian group for Peace and Freedom. They were neither peaceful, nor did they allow Noni Darwish the freedom to speak. They had the option to listen respectfully, and to take issue with her during the question and answer period at the end. They would have been heard, as were others. Instead, they tried to silence her. It’s important to note that the anti-Israel protest was not organized by UnOccupy Albuquerque but by the group Students for Justice in Palestine. ... participating in this years Israeli Apartheid Week from February 26th to March 2nd. We have a great list of events coming up and would love for you to participate in them! 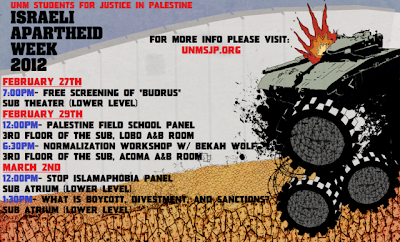 For more information on the schedule you can visit: unmsjp.org/iaw or apartheidweek.org. I believe in the process of free speech, but what I heard from the protesters was bordering on hate speech. They need to practice what they purport to preach. Abq Jew's View: "What we've got here is a failure to communicate." Communication typically involves both transmitting and receiving. The protesters were clearly transmitting a message that the audience did not wish to hear. But more importantly - the protestors were transmitting a message in a way that the audience did not wish to receive any message. Abq Jew is inclined to believe that the forceful reaction of some of the audience fit the protestors' goals quite nicely. So what is an audience to do? One option would have been to let the protestors have their say ... and see if they then left peacefully. But we Jews have learned a few things over recent years, especially - don't keep silent. Never keep silent. Epic PR Fail for the racist UNM Zionist alliance! Elderly men assaulting young ladies is never a good public relations move, especially in the digital information age! The video got over 100,000 hits in 24 hours, way to make the University of New Mexico look good around the world! I prefer the old school tactic of asking questions to get answers, over this new fangled mic check thing, but paid security should have handed evicting these ‘occupiers’ (Ironic) from a public forum on University of New Mexico Property. The Nonie Darwish talk had a big turnout and most of the attendees were glad they were there, in spite of SJP and the Occupy people getting together to disrupt the talk and prevent the speaker from speaking in the name of free speech and tolerance. Several people in the audience went to chase them out of the lecture hall, in defense of their own free speech rights. The protesters took choice videos, lied about many things and plastered it all around so it would become news. Strange that these protesters were willing to serve as an object lesson and proof of what Nonie Darwish was telling the audience: Criticism of Islam is not tolerated, and following Sharia, others have no rights or freedoms. This entire, unfortunate episode stands in stark contrast to what Abq Jew has learned about the spirited yet respectful and therefore productive and informative Community Conversation About Israel that was held earlier this month at the Albuquerque Jewish Community Center. Mr Sokolove will be reporting about the Community Conversation About Israel in the March issue of The New Mexico Jewish Link, which should be available on newsstands soon. That's the type of meaningful discussion we should strive for.